You may use this fanfolded book as a guest book | photo album | Note book | Scrap book. 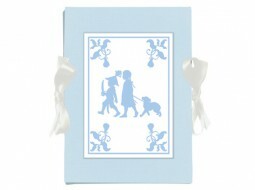 A nice baby shower gift to preserve the baby boy’s ultrasound pictures. But also the perfect gift for mothers of a new born boy or as a little baptism gift.